Can my scooter climb kerbs? A) When negotiating kerbs the maximum kerb height that any of our products can safely climb is 2", and then only when tackled head on (ie: squarely). If you attempt to climb kerbs at an angle, the front of the scooter will tend to be pushed away from the direction of travel resulting in a potential tipping action. The golden rule is to always seek out drop kerbs. For more details visit us online. Q) I have an MPV / estate car, can I transport my Class 3 scooter in it? A) We sell 7ft long folding aluminium ramps that are specially designed for loading Class 3 scooters into vehicles. You will need to remove or fold flat the rear seats in your car & be reasonably able bodied to remove the captain’s chair from the scooter. The tiller (Steering column) will then need to be folded down before the scooter is loaded into the vehicle. Q) How do I ride the scooter? A) Our scooters are very simple to ride, and all operate under the same principles, squeeze the right hand side of the forward and reverse lever top go forwards, and the left hand side to go backwards. Our scooters have a proportional throttles – that means that the harder you squeeze the lever, the faster that it will go up to the speed set by the speed control knob. Class 3 scooters have an additional high / low speed switch. When being ridden on pavements Class 3 scooters must be set to the slow speed setting for safety reasons. To brake, simply release the lever and the scooter will slow to a controlled stop with by the automatic braking system. Q) Should I buy a 3 or 4 wheel scooter? 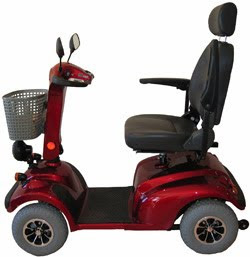 A) The main advantage of a 3 wheel scooter is that they can be more manoeuvrable in close spaces such as shops as they generally have a tighter turning circle. The main disadvantage is that they are less stable than 4 wheel scooters, especially on adverse cambers and gradients. So much so, that we no longer sell 3 wheel scooters.